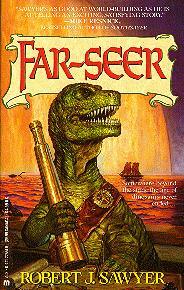 On the left is the cover of the North American edition of Far-Seer, published by Ace Science Fiction in June 1992 (ISBN 0-441-22551-9). The cover art is by Tom Kidd. The character depicted is Afsan, the Quintaglio counterpart of Galileo. The Science Fiction Book Club used the same art on their hardcover edition. I liked this oil painting so much, I bought the original from Tom. In the middle is the cover of the North American edition of Fossil Hunter, published by Ace Science Fiction in May 1993 (ISBN 0-441-24884-5). Tom Kidd went on a sabbatical to work on a coffee-table book of his own art, so Bob Eggleton ably took over doing the covers for the Quintaglio books. 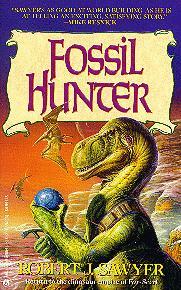 This one for Fossil Hunter was published during the year in which Bob won his first Hugo as Best Professional Artist. 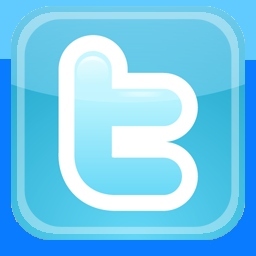 The character depicted is Afsan's son Toroca, who becomes the Quintaglio counterpart of Darwin. He's holding the Jijaki handheld computer in his left hand and a geologist's pick in his right. Note the two wingfingers flying in the background. 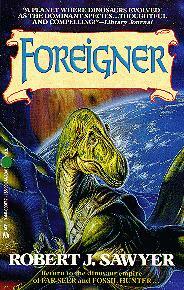 On the right is the cover of the North American edition of Foreigner, published by Ace Science Fiction in March 1994 (ISBN 0-441-00017-7). This cover is also by Bob Eggleton. The character depicted is Novato, leader of the Exodus Project; Novato is Toroca's mother. Unfortunately, the scroll with the word "Foreigner" on it covers most of the stunning view of the Face of God rising behind the Quintaglio home world.